This intro was added 28/12/15 – In the interest of better communication, the partnership led by Venture Arts, with Castlefield Gallery and BALTIC Centre for Contemporary Art, Gateshead would like to further clarify the OutsiderXchangeS project. The partnership planned this project to be a professional development opportunity for both learning disabled and non-learning disabled artists. For learning disabled artists this is an opportunity to work alongside other artists, one or two days per week when they will use the shared studio as a drop in studio. Learning disabled artists will not be based there at other times. For other artists, this will be an opportunity to interact with learning disabled artists. The open call is intended to attract artists who want to learn from learning disabled artists and the exciting field of learning disability visual art practice. The selected artists will have their own free studio space for 5 months, which will be adjacent to or adjoining the shared studio space. The studios will be at Baltic 39, Newcastle and project spaces run by Castlefield Gallery in Manchester. Artists will not be expected to lead or run workshops, or support learning disabled artists. That is the expertise and responsibility of Venture Arts. The idea is to create a platform for collaboration to take place between artists. We envisage that all artists involved in the project will be inspired by each others practice in creating work. The £1,000 bursary is to support artists in their own practice. The partnership is led by Venture Arts, who have been working in visual arts with learning disabled people since 1985. Venture Arts is a small charitable organisation that works from Manchester with learning disabled artists. Venture Arts have selected 5 learning disabled artists to work in the shared studio space, once or twice a week. They will be accompanied by lead project artist Tanya Raabe-Webber and experienced artist mentors. This project aims develop the work of talented learning disabled artists, through giving them the opportunity to work in a professional artist space alongside other artists. Castlefield Gallery, with BALTIC Centre for Contemporary Art, Gateshead, and the Contemporary Visual Arts Network (CVAN) are partnering with Venture Arts to help deliver OutsiderXchangeS, an exciting, experimental, collaborative visual arts project that will bring together learning disabled and non-learning disabled artists to develop shared ideas and new contemporary work. Venture Arts are now seeking expressions of interest from visual artists who would like to be considered to engage with the OutsiderXchangeS project. OutsiderXchangeS came about to develop the talents and profile of learning-disabled artists and also to investigate the potential to make new, interesting, challenging work through visual artist ideas exchange and real collaboration. Lead organisation Venture Arts are looking for 5 artists to work alongside 5 learning disabled artists to develop ideas, share practice and, through collaboration, develop contemporary art. The partnership is particularly keen that this initiative creates an opportunity for both learning disabled and non-learning disabled artists to share an interactive workspace, for their own work and the potential for collaborations. 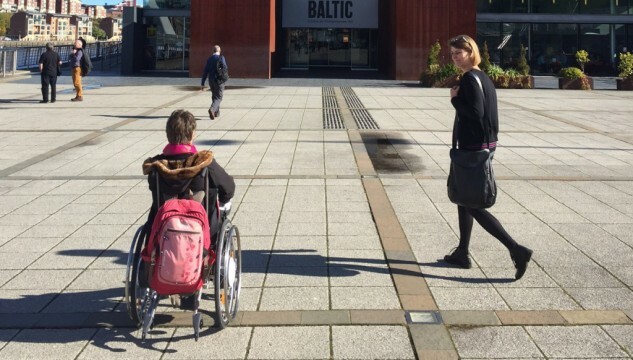 Acclaimed disability artist Tanya Raabe-Webber will work with all the artists involved focusing on assisting in the collaborative process with all artists, as well as developing her own work throughout the project. The intention of the project is that the work will be shown on a number of platforms so we are particularly interested in hearing from artists who use a range of media in their work. All successful artists will receive £1,000 bursary and given a free studio space for five months (February – July 2016). Learning disabled artists will also be working from the space for 1 day per week, sharing ideas and developing their own practice. The bursary is for artists to use in the production of their own work. The project and art created will be showcased by Venture Arts, Castlefield Gallery and BALTIC Centre for Contemporary Art, following the residencies in Autumn 2016. The work will be made in Manchester and in Newcastle Gateshead so we are looking for 4 Manchester based artists and 1 Newcastle Gateshead based artist. Manchester based artists will work from a central studio location in Manchester and the Newcastle Gateshead based artist will be at BALTIC 39, Newcastle. Brief outline stating your interest in being involved in this artist exchange. Brief outline of initial ideas of how you would interpret and approach the project. Contact Amanda Sutton for any further inquiries you have regarding the project or the application process.